Driftwood, coconuts, bamboo, tropical flavors and rum—lots of rum—are the essence of the tiki pop culture. 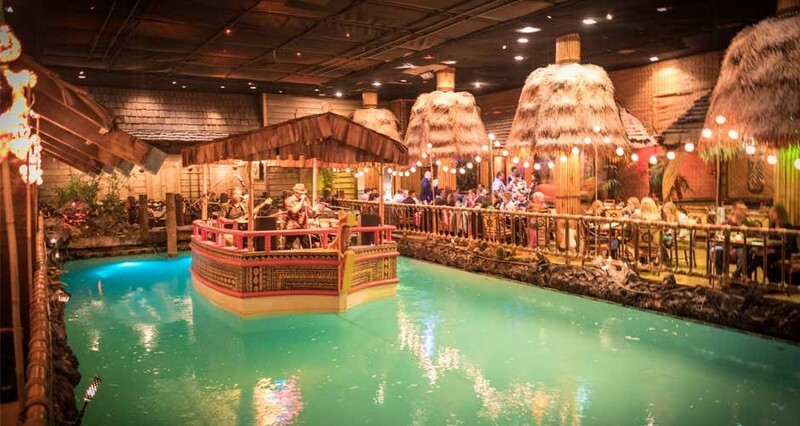 The first tiki bar started out in the 30’s, in a time where cocktails consisting of a blend of tropical flavors were a foreign concept to the American public. Nowadays, tiki bars are beloved for the way they craft innovative cocktails with exotic ingredients. But, tiki is more than just a bar and restaurant. It’s a culture of people with the passion for this specific art of cocktails and the exotics of Polynesia and the Caribbean. But what is the tiki culture and what does qualify as a tiki cocktail? The beginning of tiki bars started in the 50’s when Ernest Gantt (better known as Donn Beach) opened the first tiki restaurant in California. He combined his comprehensive knowledge of the far-away tropical lands and his imbibing skills in an over-the-top tropical bar. But, he wasn’t the only one who revolutionized the cocktail world. Victor, better known as Trader Vic, started his own tiki restaurant with legendary cocktails. It was a time where palm trees, feet in the sand, and blue beaches were just a far-fetched dream for many. Both Donn and Vic realized how people were allured by the tropics and willing to spend more bucks in order to enjoy some tropical flavors. They both began experimenting with flavors inspired by the tropics and expanded their restaurant across America. Donn was a well-traveled man, who visited many islands, and it was exactly this wanderlust of him that fueled his inspiration for his bar Donn the Beachcomber. His travels to the Polynesian islands, combined with all he has seen in the Caribbean were the building blocks for his restaurant. His restaurant was filled with the bric-a-brac of everything he brought back from his travels. But, Easter Island heads, Cuban rum, and Chinese food isn’t exactly the most accurate representation of the Polynesian culture. Yet, people still emerged themselves into the atmosphere he was selling, because no one was able to travel to Tonga and see whether people really drank cocktails with 3-layers of rum, pineapple juice and some umbrella on top. The success of his business laid the groundwork for the tiki restaurants and bars that followed, including that from Trader Vic. The term Tiki comes from the Maori mythology. The Maori are indigenous Polynesian people of New Zealand. According to their religion, Tiki is the first men created by Gods. Ever since the old days, Polynesian tribes carved images in trees of Gods. When Trader Vic’s opened his first tiki restaurant he placed a similar type of carving from Tiki (it became known the “Tiki statue”) outside his restaurant. They used this same image on their menus and other presentation materials. This was the beginning of the connection between Polynesia and what we now know as the tiki pop culture. Donn decorated his place with everything he collected during his wanders, while Vic traded knick-knacks for cocktails with his visitors to dress up his restaurant. They created an escapism of leaving the outside world with, literally, one single step and entering a world that is the complete opposite of their reality. Step into a tiki restaurant or bar and you’ll find still find Tiki statues but also moody string lights, bamboo, and palm trees and coconuts everywhere. Plus, the oozing sound of tropical rain and 50-shades of brown. But the escapism created by a tiki bar doesn’t only lay in the décor, but it’s the actual drinks that transport people to tropical paradise. A tiki cocktail consists of ingredients that balance and complements each other like chemistry in a glass. It’s layers of tropical flavors with a complexity that can overwhelm any first timer with an unconventional presentation to captivate the eye. When Donn started, his cocktails were all about Rum. He developed a Rum Rhapsody that over the year kept evolving but is still the essence of a good tiki drink. Take for example the Planter’s Punch. It’s based on that same poem that says: One of sour, two of sweet, three of strong, four of weak—and five of spice to make it nice. This does refer to the fact that a true tiki cocktail needs to consist of 1-part sour juices, 2-part sugar syrup, 3-part spirits & liqueurs, 4-part juices or (ice) water, and baking spices or bitters to give an extra dimension to the cocktails. The fundamental flavor of a tiki cocktail is rum. It always has and probably always will be. Then you have the fresh juices like lime, pineapple, grapefruit and orange juice that adds a touch of tropical. But the layered complexity comes not from the blend of rum and juices alone, but also different liqueurs, bitters, and syrups. Think about Falernum, Orgeat Syrup and of course…Curaçao Liqueur (an ingredient that’s part of the best tiki cocktail in history, Mai Tai).